There are hundreds of satellites orbiting earth and it is possible to see a lot of them with the naked eye. They are however only visible for an hour or so after sunset and and hour before sunrise. Why are satellites only visible after sunset and before sunrise? The satellite needs to be in the sunlight so that it can reflect the sunlight in order to be visible. You on the other hand, needs to be in the dark so that you can see the sunlight being reflected of the satellite. See image below. This condition is only possible just before sunrise and after sunset. If you look up in the sky just after sunset (or before sunrise if you are brave), it won't be long before you see a satellite. 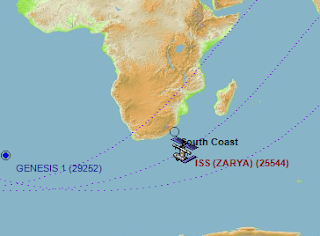 With a satellite tracking program like WARSAT or using a website like Heavens Above, you will be able to predict exactly when and where a satellite will appear. 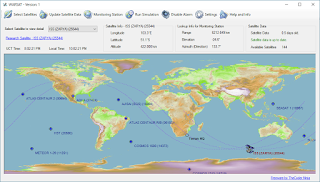 You can download WARSAT - the Free Satellite Tracker. After you installed, you will need to update the satellite data (you will be prompted, just select 'Update'). You can also select some others. 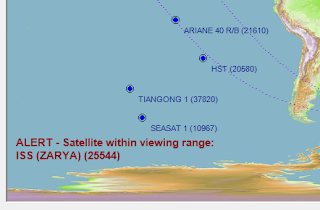 The most default satellites that you can choose from in WARSAT Satellite Tracker is visible with the naked eye. You will also need to make sure you have set up your monitoring station correctly (click on Monitoring Station). The monitoring station is your location (longitude, latitude and elevation). You can just click on the link in the setup screen to get your details. These details are needed to correctly calculate the position of the satellite in relation to yours. Once all that is done (sounds like a lot, but you only need to do it once), then you can just open WARSAT after sunset. When a satellite is in viewing range, an alarm will sound and on the left bottom of the screen a message like the one below will appear. Click on the satellite that is in range (see below). The elevation is elevation above the horizon, 90 degrees will be straight up, so 23.4 will just be above the horizon. The Azimuth is the direction. 0 degrees is North, 90 East, 180 South and 270 West. So 158 will be South-East. You will also be able to get a good idea of where the satellite is in relation to your position by simply looking at the map. Then all you need to do is go outside and find it.